I started a cake decorating course at my local community centre a few weeks ago. The reason I signed up is a simple one – while I absolutely love making cakes, they never look particularly pretty (evidence of this can be seen all around the blog!). I had absolutely zero experience of anything relating to decorating cakes before I started – adding water to icing doesn’t count! So I knew I would be pretty much bottom of the class from the start. It’s quite a small class, with around 10 of us (all women) attending each week. Many of the others have been to the class in previous terms, but there are a couple of other women who, like me, have never done anything like this before. The first class was pretty much an induction, but it was good to find out what we’ll be doing over the next couple of months. I’d never come across most of the concepts before, but I’m very excited about attempting to make an edible handbag and string people (I might try to make a string cow!). Last week, we tried our hand at brush embroidery. I had never heard of the technique before and was a little worried about it – I envisaged two hours of attempting to ’embroider’ a sheet of rolled-out sugarpaste and failing miserably. However, it’s not quite what it sounds like. The technique involves piping royal icing in a pattern of your choosing (in our case, a flower) on to some sugarpaste and brushing the icing in such a way that it creates a pretty textured effect. We used a flower-shaped cutter first to emboss the design on to the sugarpaste, and then made our own piping bags and filled them with some royal icing that the tutor had already made the previous week. We were encouraged to mix some bright colours into the icing. I attempted to mix red and blue to make purple, but didn’t mix in quite enough red and ended up with this blue instead. 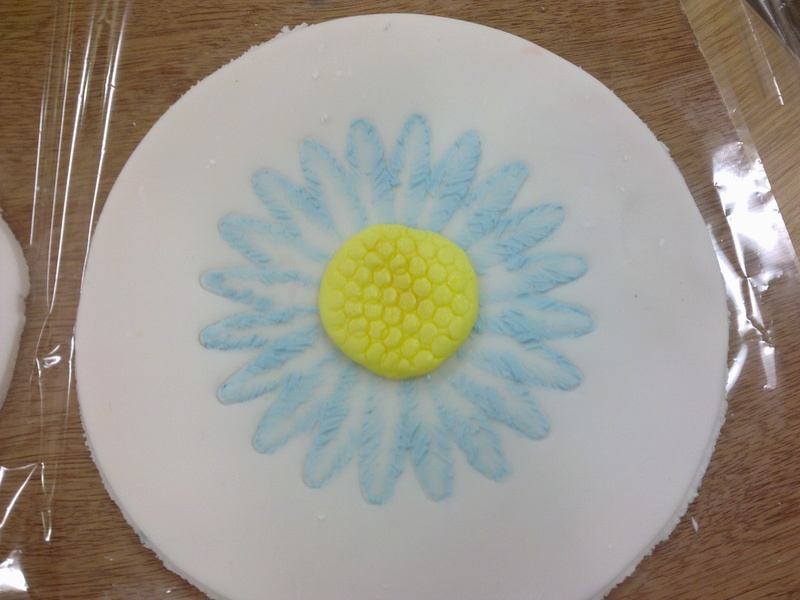 We then created the yellow middle using a bit of sugarpaste embossed with a repeating circular pattern, which was done using the end of a straw. I’m quite pleased with my efforts – it at least looks neat and like a flower! It’s a far cry from some of the more professional results you can gawp at elsewhere, though – but hopefully with a bit more practice I can make my brush embroidery look more artistic. We’re going to be playing with Mexican paste (something else that’s brand new to me) this week – hopefully I’ll do a tad better this time round!